During the Middle ages Lepetane was called “The Place of Saint Lovrienec” for the church which existed there and which is connected to a legend of three brothers – saints: Andria, Peter and Lovrienec. “Lepetane” got its current name by the nicknames of some Perast families (“Lepetanus”) which owned land in this area. There was a stone pit and it was in use until the mid-20 th century. The stone was used for walkways, terraces and plazas in the Bay. Nowadays the village is best known for the ferry crossing kamenari-lepetane, and the resulting traffic congestion in the summer. Villa Serventi – This property is 8 minutes walk from the beach. Located only 20 meter from the Adriatic Sea, Villa Serventi is housed in a traditional stone building. It offers an on-site tavern and self-catering studios. Its guests can relax at a private beach area or enjoy sea views from a furnished terrace. Surrounded by greenery, all apartments are air-conditioned and decorated with stone wall elements. They comprise a fully equipped kitchenette with a dining area, as well as a private bathroom. Amenities include cable TV, a CD player and a hairdryer. The Villa Serventi tavern serves fish specialities and features a summer terrace. A selection of hot and cold drinks is available. Barbecue facilities are also at guests’ disposal. Fishing and snorkelling boat trips can be organised upon request. The nearest pebbly beach with a beach bar and billiards facilities can be found 1.5 km away. Free private parking is possible on site. 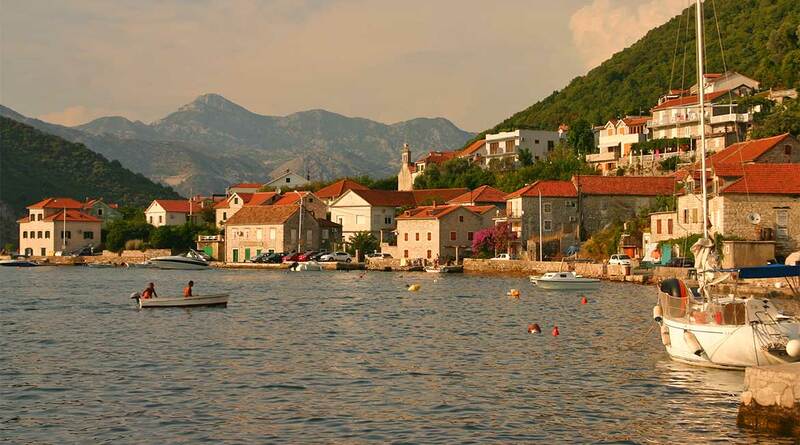 The property organises boat trips around Kotor Bay and car tours through the north of Montenegro. Facilities : Free Wi-Fi Internet, Free Parking, Car Hire, Airport Shuttle (surcharge), Garden, Laundry (surcharge), Luggage storage, Beachfront, Outdoor furniture, BBQ facilities, Balcony, Car hire, Bicycle rental (additional charge).